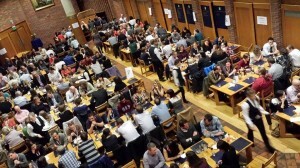 Last month the British Society for Parasitologists (BSP) held their 52nd Spring Meeting in Cambridge. The three day event opened with a reception in the beautiful Fitzwilliam museum on Sunday 6th April. With well over 500 parasitologists from all over the world attending, there was a lively and vibrant atmosphere. Each of the 3 days opened with a plenary talk in the morning, followed by 6 categorised presentation sessions; Apicomplexa, Trypanosomes/ Leishmania, Helminths, Evolution, Veterinary and Communication- all running in parallel for the rest of the day. Over the 3 days, over 160 talks were given by scientists from PhD students to very, very senior professors. The sheer number and quality of talks given was incredible. Due to the nature of my own work, the majority of the talks I attended were in the helminth sessions. I was particularly struck by Dr Birgitte Vennervald’s (University of Copenhagen) talk on Urogenital schistosomiasis, in particular Female Genital Schistosomiasis (FGS). FGS is a lesser known form of the disease associated with increased risk of HIV transmission and infertility, the symptoms of which include itching, bleeding, discharge and characteristic “sandy patches” on the genital mucosa. It was disturbing to learn that this strikingly unpleasant affliction may be much more common in young children than previously thought. On a merrier note, another talk that stood out for me came from enthusiastic PhD student Paul McCusker (Queen’s University Belfast) who reported his success in maintaining juvenile Fasciola worms in vitro, which enabled subsequent investigations on tegument proteins that could be targeted for RNAi-based interventions. Amusingly, Mr McCusker marked the worms’ 100 days of survival in vitro with birthday cake for his lab, highlighting the importance of celebrating triumphs in the lab! Other highlights for me included participating as part of the audience for the recording of an episode of the BBC radio show The Naked Scientists. The audience were encouraged to ask a panel of BSP members thought provoking questions related to tropical diseases. Fuelled with some rather hilarious questions- particularly about consuming tapeworms for experimental purposes, it was a very exciting experience.This was also the first year the BSP included a session of career advice talks. Targeting a range of scientists, from students to those considering fellowships, the talks offered a unique insight in career moves post-PhD. TV presenter Dr Mike Leahy from BBC’s Rough Sciences, Sky1’s Invasion of the Bodyscratchers and National Geographic Channel’s Bite Me also gave a terrifically energetic presentation, describing his winding path from academia to TV. The annual CA Wright medals were presented to Prof. Alex Rowe (University of Edinburgh) for her work on receptor-ligand interactions in severe malaria and also to Prof. Michael Barrett (University of Glasgow) for his work in the mechanisms of resistance to anti-protozoal drugs. Other highlights of the meeting include the Young Parasitologist’s party which kicked off with an entertaining pub quiz followed by a special performance by the Dr Snow’s Pumphandle band starring leading BSP parasitologists. And of course the annual ceilidh gala dinner was also a roaring success. Overall, everyone commented on how enjoyable the experience was and what organisation it must’ve taken to organise such an immense event. I talked to Dr Emily Adams about her role in the organisation. “We are really pleased with the outcome of BSP2014. We have been planning the event for a couple of years and a lot of hard work has produced a high quality meeting, with excellent science at the fore-front. The event has been a sell-out and thanks must go to Dr Mark Field and Dr Owain Millington for their organisation. The BSP is now looking forward to BSP2015 in Liverpool!”, Dr Emily Adams. Finally, with acknowledgments from former BSP president Prof. Simon Croft, Prof. Judith Smith was inaugurated as the new president of the BSP. I asked her about what she hopes for the BSP over the next year of her presidency- “I think this year’s meeting, with outstanding international science across the discipline, has been fantastic. In parasitology we need to have global connectivity to effectively fight disease but also to bring together scientists working across genomics, biochemistry, drug design and vaccinology with vector biologists, medics, vets, epidemiologists and ecologists. The BSP aims to take up this challenge to ensure this exciting interface between scientific areas is maintained and developed. We take this forward next year with a key symposium on disease ecology and the Liverpool meeting that will have important focus on neglected tropical diseases and vector biology”.